Each individual region on the continent of Africa has a rich heritage for traditional marriage and they will range widely from the Amhara in Ethiopia to the Massai in Kenya. The most used and recognized traditional ceremony is the Yoruban. A traditional Yoruba wedding ceremony is shown complete with a priest. On the bottom row is the headdress the priest would wear. Yoruba is an African language that is spoken in Nigeria, Benin, Togo, and among communities in Brazil, Sierra Leone and Cuba. Included are pictures of an Igbo wedding ceremony - Igbankwu Nwando at Awka in Eastern Nigeria. The Igbo culture & traditions are very rich and rewarding especially to the Oraifite people. In red and yellow dresses is a picture of Igbo Music Dancers at the Igbo wedding ceremonies. Each individual region on the continent of Africa has a rich heritage for traditional marriage and they will range widely from the Amhara in Ethiopia to the Massai or Swahili in Kenya. 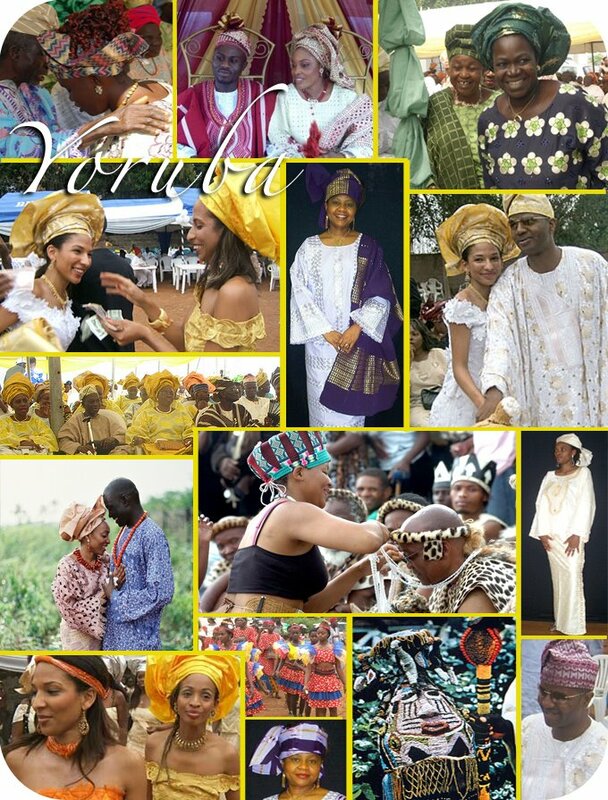 The most used and recognized traditional ceremony is the Yoruba. Ìgbéyàwó is a Yoruba1 word meaning marriage, wedding, "or bringing home the bride". The use of this word is very common in the area of Nigeria and beyond, as a way to convey the traditional heritage and to share details about wedding events. In the center of the collage is a photo of the newly elected African National Congress (ANC) President Jacob Zuma in the ceremony for his own wedding ceremony.